Lady Clare custom placemats for Yachts, Country Clubs, Hotels, Catering Facilities and other hospitality businesses. Lady Clare specializes in the production of bespoke placemats, coasters and home accessories. Our studio is well equipped to provide a professional custom design service, offering a wealth of opportunities ranging from a hotel or corporate branding exercise to a gift celebrating a special family occasion. Traditional Placemats - the classic Lady Clare hand finished tablemat featuring a print mounted onto a painted base with a gold or silver edge and sealed with heat resistant lacquer. 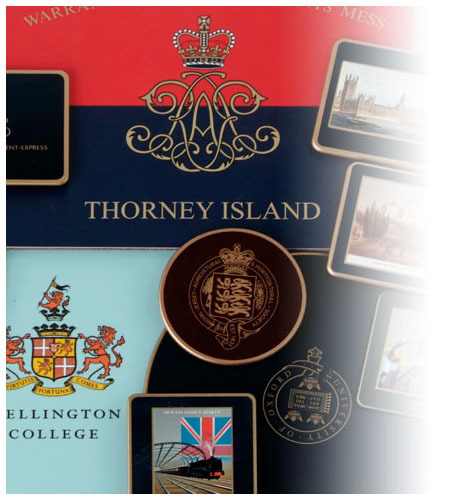 Screened Placemats - a stylish way of promoting corporate identity. Lady Clare Screened Placemats feature a screen printed image on a painted base and finished with a coat of protective lacquer. Melamine Tablemats - ideal for catering and corporate customers, Lady Clare Melamine Placemats are heat resistant to 150°c and are both attractive and highly durable. Accessories - Lady Clare's range of Trays, Waste Bins, Magazine Racks and Desk Tubs are also highly suitable for customization. Please contact Merchant of Prato, The US Representative for Lady Clare to discuss your requirements. **There is a minimum order of 50 mats/coasters per image. For example, if you wish to have your company logo on all mats, you would need to order 50. If you wished to have a set of 4 different photos on your mats, your would need to order 50 of each image, therefore making your total 200 mats.